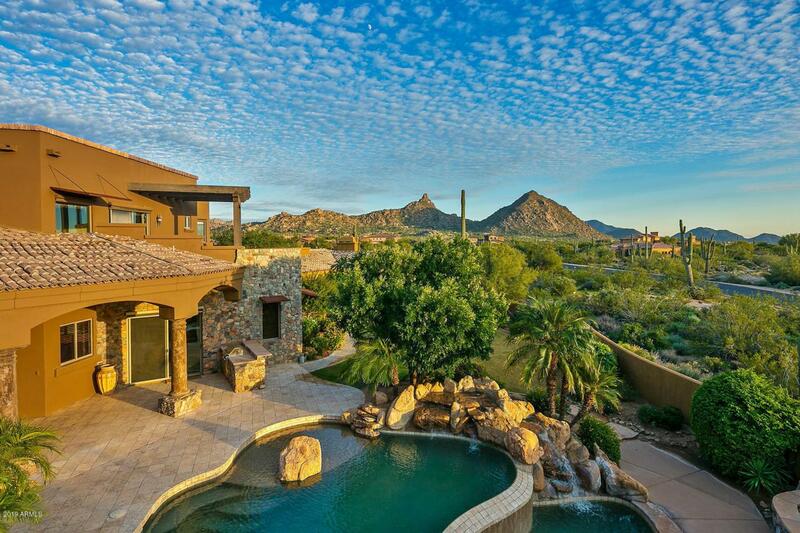 Tuscan Estate nestled below Pinnacle Peak, situated on nearly 5 acres, with expansive sunset and mountain views. Private gated entry with circular drive and garage space for 10 cars. Estate surrounded by mature landscaping with courtyard fountain, two-tier pool with slide, and spa. Expansive floor plan containing 5 bedrooms throughout: 2 master suites (one on the main floor), 2 additional en-suite bedrooms, formal dining/living rooms, chef's kitchen, family room, media room w/ wet bar, game room, den, exercise room, and wine cellar. Custom finishes include: venetian plaster, slab granite, tumbled travertine floors, cantera stone, wood beams, stone columns, iron front door, and alder cabinets/doors. Adjacent to the house is a guest casita equipped w/ kitchenette and bathroom.